I had a coffee with Goethe, Byron, Franz Liszt, Keats, Hans Christian Andersen, Mendelssohn, Wagner, Hector Berlioz, Shelly, Mark Twain, King Ludwig of Bavaria, Giacomo Casanova, and yes, Sitting Bull. It was not far from the Spanish Steps in Roma. Waiters in black tails and bow ties joined frilly white pinnies flowing back and forth. A handsome waiter elegantly set my €9.00 orange-rimmed (color-not fruit) cup of cappuccino on my table. My back drop was an age-spotted gilt mirror reflecting a sofa that belonged to Hans Christian Anderson but sat empty in a Roman coffee bar older than the U.S. Declaration of Independence. I guess he forgot he left it there. I love any sense of antiquity and authenticity and Antico Caffe Greco has that along with the lingering sense of its former customers. It also has one of Roma’s greatest bathrooms which, in all its glorious 250 year-old marble, certainly makes up for the high cost of my €9.00 treat. Typically, one stands in Italian coffee bars which in that case means my cappuccino would have been only €2.50. But I imagined my friends from antiquity would have been at tables so I escaped the crush of Via Condotti and transported myself into history. Whenever I travel I am always on the lookout for time machines that change my perspective and proclaim authenticity is necessary. 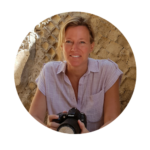 My historical adventures keep growing because each one reveals another unknown adventure that draws me closer. It was a different experience directly west of the short end of the bar where I took in the Chicago 3:00 A.M. scene. 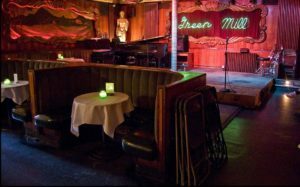 Al Capone and his men would sit right here in this same booth at the Green Mill because it afforded clear views of both the front and back entrances to the establishment. My good friend, Pat Mallinger, the legendary Chicago saxophonist, has played here every weekend for 25 years. As I write this, Pat has just moved the tune, It’s Surely Gonna Flop If it Ain’t Got that Bop, well beyond his introductory hard bop and into modal territory with enough potential to stir Eddie “Lockjaw” Davis back to life. I feel like I’m going to explode. Green Mill is a far cry from the elegant Via Condotti and my coffee with Sitting Bull but the authenticity is the same. 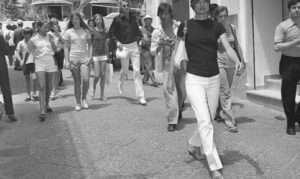 Definitely matching the Roma coffee bar elegance however, is a family business in Capri where the sandals on my feet were also made for Princess Margaret, Maria Callas, Jackie Onassis and Grace Kelly. 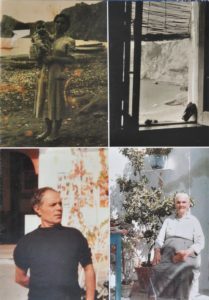 My grandfather transmitted both his passion and skill to his children, Angela, Rita and Michele (my father). 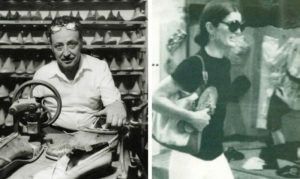 They then taught the art of sandal making to my brother Fabrizio and to me, Costanzo. It had become late in the evening and Via Camerelle was hushed in a light rain as I relished the feel of the store and listened to Costanzo Canfora’s stories. 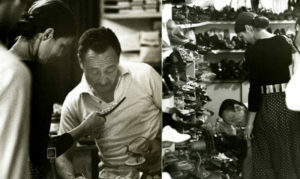 The aroma of shoe-making somehow seemed the perfect accoutrement to passion, family, and elegance. Taking in all that surrounded me, I entered a different time. I turned around and saw Jackie on the wall pictured with Amedeo on that famous midnight but Grace Kelly could have walked in at any minute. My now-favorite sandals are not a personal emblem or possession but remain a simply -stated experience that remind me of Costanzo’s eloquent passion and my appreciation for family tradition and pride. 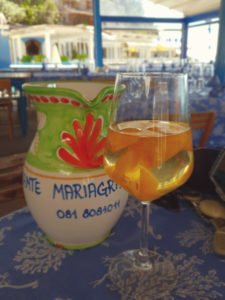 A glorious, painted pottery pitcher brimming with crisp dry white Campania wine offered coolness to the half-dozen sliced, fresh peaches that were swimming toward my glass. 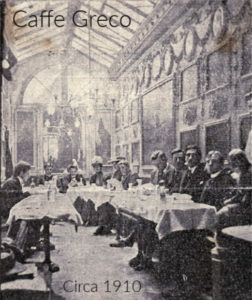 The setting (and peach effect) took me back to 1901 and Donna Rosa Grazia, founder of Maria Grazia restaurant. 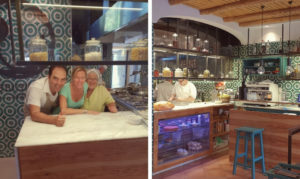 As soaked up the saga, her grandchildren, Lello and Andrea were back in Maria’s beautiful kitchen. 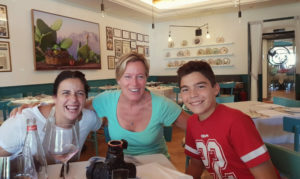 Maria started out making dinners for local fishermen and then for the rich famous of Capri who discovered her and sailed over into the beautiful and remote Marina Contone. In 1952, just for fun she created spaghetti with zucchini, a dish now famous and on almost every Campania menu. Immersed in the experience of this tiny fishing village, the peaches suggested I jump into the clear Mediterranean Sea just 10 meters from my table while I waited for my antipasta to arrive. I just couldn’t resist the temptation and swam between colorful fishing boats caressed by warm water feeling deep contentment each time I raised my head for the exquisite scene . My post-swim appetite was voracious and the meal was dilizioso. It still holds its place in my top three, all-time best lunches. As often occurs for me in little Italian villages, the family was gracious and settled in at our table offering stories and photos that helped me take my time machine back to when Roman Emperor Nero fell in love with this remarkable Mediterranean cove. Not all my adventures take me back to antiquity but I always love the total commitment, love, and respect that fills a family business with something that can never be duplicated. Although a relatively new trattoria, Lo Stuzzichino (Sant Agata, Italy) filled me with reminders like the zucchini flower antipasta filled my culinary desire. 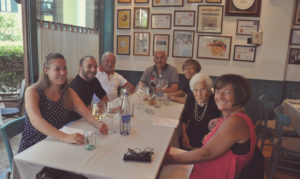 The deep love of his family’s ristorante rising up from Paola De Gregorio’s enthusiasm nourished a very special day in Campania. The day ended with lots of kisses, drinking wine and taking photos with the family as well as joining a typical Sunday afternoon family celebrating a 91 year-old’s birthday. The food was amazing but I left with more in my heart than in my stomach. I love Italy. Thank you, Paulo, for an unforgettable experience. I do not seek to fill my life; I choose only to nourish it. Tradition provides nourishment to all who decide to ingest it. My two-decade lifestyle has grown into a band of like-characters moving through life via a common thread bonding us in experiences rarely shared together. Joy, pain, love, and laughter provide our untethered lives with a rock-like steadiness that keeps us from being swept into the currents of a world that is moving much faster than our tortoise-like lives. This has grounded us in a tradition of authenticity and that makes me feel at home in the bosom of our unique family that had to be. Tradition, at its very least, holds us back from excesses. I believe it leads us all to more understanding of the planet family and instills perspective. My friends and I stumble easily through geographic points not separate from the inhabitants but letting ourselves fall into our authentic lives without fear or doubt. Our self-created tradition is not of antiquity but from the love of what antiquity offers us. Literally walking the globe alone in our stupor of human connectivity, we silently stand for an authentic life without compromise. It is much the same as all traditions that frame our responses to the world regardless how ancient or new. Thank you Lana. I would like to hang out with your “band of characters”. I love tradition in all forms but sadly feel it has become less appreciated in America and other places. In Italy, tradizioni, especially religious and family-oriented ones are still a big part of daily life. I will never lose the feeling I had at my first religious festival (St. George in Rabat, Gozo) I had forgotten that type of passion and community existed. If you are ever in Europe, especially Malta and Italy, when there is a Saint’s Festival, don’t miss it. I love that Lana wrote “Tradition, at its very least, holds us back from excesses.” Perhaps it is because tradition satisfies something in us that leads us to know that simple pleasures and familiarity bring contentment. Every week I cant wait to see what you post Lana. Is there a specific day you post your new blogs? Thank you Tradizioni for your thoughtful comments. I hope more people will learn to connect with the authentic experiences of life. Every Friday I intend to post a new blog highlighting more experiences that shape my contentment.